What's a SoCapOtt and Why Will I Be There? social media industry’s most engaging experts who will share best practices, personal journeys and strategic wisdom with an audience of social media pupils, both intermediate and advanced. SoCapOtt looks like a great opportunity to learn and network with folks who work with social media. 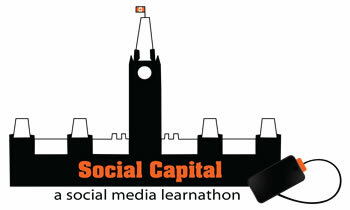 "Social Capital promises to be an inspirational and educational day of awesome. The speakers and panelists bring to the table some of the finest social media practitioners available; there will be something for social media fanatics of all levels." You can check out the full speaker line-up on the SoCapOtt website, but trust me, it's like a who's who of the Ottawa social mediasphere. Incidentally, I'll be there and I'll be presenting. My topic is social media for non-profits, and it will be based on the work I've been doing over the past few years with Movember and Canada Day Barrhaven. It's part presentation, part workshop so I invite you to bring your non-profit-related questions and we can work through them together. Registration just opened and early bird tickets are currently available. Hope to see you there!